From time to time, we ask our food authority friends and fellow Workman Publishing authors to write guest blog posts or share excerpts from their books for BarbecueBible.com. Today’s comes from one of the legends of American food writing: Mimi Sheraton. 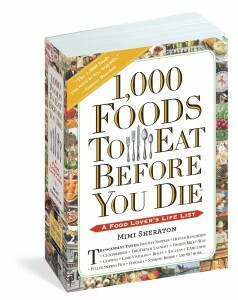 Author of the new 1,000 Foods to Eat Before You Die, Mimi has written the most comprehensive book ever on the great foods of the world. Gargantuan in its appetite and encyclopedic in scope, this is the book every food writer dreams of writing. Here’s her take on American barbecue. Man has smoke-cooked meat over fire since ancient times—and Caribbean natives of the “new world” were certainly doing likewise, calling it barbacoa long before the colonists got in on the act. 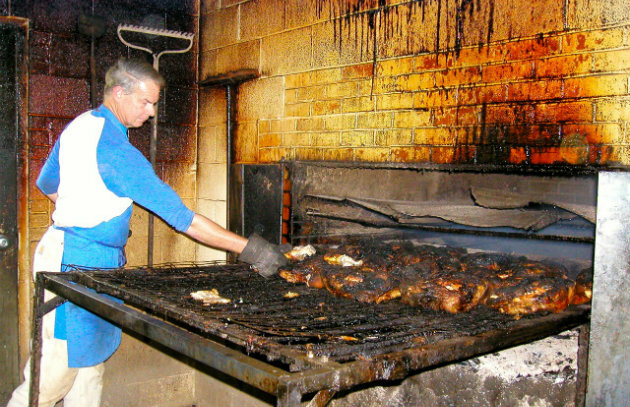 The modern idea of American barbecue grew directly out of the barbacoa tradition, and smoking whole hogs over pits is a technique now common in both North Carolina and Virginia. Since then, barbecue has been strongly associated with the southeastern United States. But the specialty, once relegated to wide-open rural spaces, has moved to the big city in a renaissance that is easily understandable, given the lusty appeal of these succulent meats. With some contingents swearing off meat and meat by-products entirely, or just lowering their meat consumption and upping their vegetable quotas, still others have only deepened their devotion to richly glazed, fragrant barbecue, elevating its mouthwatering bites of crisp fat and tender, juicy flesh to something approaching cult status. “I think about barbecue like some people think about wine. The good stuff? You know it when you taste it.” So says Keith Allen, pitmaster at Allen & Son, one of North Carolina’s most important barbecue joints. But in truth, things aren’t so simple, and depending on where you are, your definition of “the good stuff,” and even of the very word barbecue, may vary. The variety inherent to the barbecue landscape is strongly linked to geography, which gives barbecue lovers that much more reason to travel. In North Carolina, it’s all about hog. Along the eastern and coastal part of the state, pork shoulder (Allen & Son’s specialty) is slow-cooked over hardwood coals; drenched in a hot, tangy sauce of vinegar and red pepper flakes, the meat is tucked into a soft white bun and topped with cool, sweet, mayonnaise-based coleslaw. Head west, where the Piedmont plateau’s sand gives way to clay, and it’s not just the soil that turns red—it’s the barbecue, too. Western Carolina barbecue, also known as Lexington-style, means a slow-cooked pork shoulder seasoned with a vinegar-and-pepper sauce and sweetened by ketchup. In Texas, barbecue means smoky, pit-cooked beef brisket. Like Texans, Kentuckians also eschew pork for their barbecue, but they slow-cook mutton doused in a sauce of vinegar and Worcestershire. In most regions, however, barbecue is synonymous with pork. In Louisiana, barbecue is cochon de lait: pulled meat from a suckling pig that has been split, spatchcocked, and suspended on a frame or pit-roasted over hardwood coals, served in a split sub roll with slaw in the manner of a po’boy. In central South Carolina, pulled pork is dressed in a mustard-and-vinegar sauce and served in a bun or as a plate lunch, while in Kansas City, Missouri, the meat is placed atop slices of white bread with generous amounts of thick, sweet sauce that combines acidy tomatoes with sticky sweet molasses. In Memphis, Tennessee, a pungent dry-rub seasoning lends a spicy crust to the meltingly tender smoked pork ribs; no sauce need apply. Excerpted from 1,000 Foods to Eat Before You Die. Copyright © 2015 by Mimi Sheraton. Used by permission of Workman Publishing Co., Inc. New York. All Rights Reserved. See the book for Mimi Sheraton’s list of recommended barbecue restaurants, events, and references (including the Barbecue! Bible). And give us your own recommendations on the Barbecue Board or Facebook.